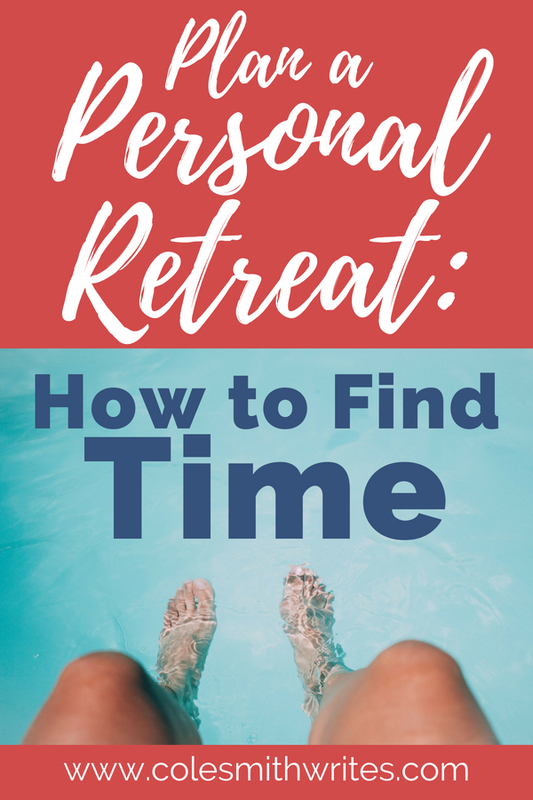 Have you ever wished you could take a personal retreat, make a little me-time to recharge, but didn’t think you had enough time? Consider the consequences! If you don’t take time to care for yourself now, you’ll have to make the time later when you suffer burnout, sickness, and the other side effects of stress and busyness. Would you treat your best friend that way–pushing and pushing until she breaks down? Of course not. So love yourself like you love your friends and family. If you’d advise them to take a break, it’s only fair to follow your own good counsel. So search your heart for excuses. Recognize them as that–excuses! Fear probably has you in its grip. All the bad what-ifs can really get us wound up. So allow yourself the luxury of envisioning a truck load of wonderful what-ifs: What if you came back refreshed and renewed and refilled with joy that made others feel good just to be around you? Maybe you’ll relax enough that your poor, drowned-out subconscious can finally play and release a bunch of incredible ideas! What if you had a breakthrough that helped you change your family’s course for the better? If you’re a new mom, you’re probably not going to get away for the entire weekend. If you’re retired, what’s to stop you from taking three or four days? And if you’re somewhere between those points, you may have a moderate level of flexibility. My own Mr. Smith works a rotating 12-hour shift schedule. So when I need to take time to plan and play, I choose his weekend on day shift; I barely get to see him those days, anyway. If you’re the one who volunteers to do everything, and are booked every weekend from now ’til New Year’s, you’ve got two options. Get away during the week, or call off! Let someone else have the opportunity to bring the cookies to book club. If you got sick, you’d have to cancel. Why feel guilty for calling off to stay healthy? Even if you think it’s utterly impossible, you need half a day at least. A good six hours will work wonders if you’ve been running dawn ’til dusk for as long as you remember. Now that you’ve given yourself permission to go for it, and you’ve decided the length of your retreat, it’s time to get creative about how to make it work. Maybe you can swap Saturday child care with another family; they take your kids, then you take theirs so they can get away for a day. Maybe you have a relative who always wants to spend time with your kiddos, but you both have never taken the time to schedule an outing. I even know a lady who takes a retreat while her husband goes camping with their two girls. You can even look into camps and programs offered for summer. If you’re a caregiver for an elderly family member, it’s difficult to step away but still possible. Schedule an in-home care service for a day or two, and train your helper. It’ll ease your mind to show them the ropes and leave instructions for your absence. (And of course you’ll go somewhere relatively close, a place you can be easily reached in case of emergency.) If the idea of hiring a stranger is too hard to swallow, consider a friend or church member who works in the medical field, someone you know and trust. Once you decide to take a personal retreat, you’ll be amazed at the ways you can find time to make it happen. Next week, we’ll brainstorm the fun part–the location! NOW YOU: Have you ever taken a personal retreat? If not, what’s stopping you? I have been thinking about this and would like to find a quiet writing retreat.